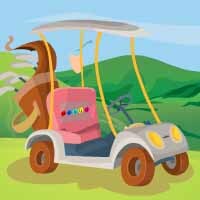 Golf Ground Escape is another point and click escape game developed by Genie Fun Games. Your friend is trapped inside of the tree door find the key and rescue her. If keep late it may give breathing trouble to her so make it quick and open the door. You can find useful stuffs and interesting clue's symbol's to solve and finally escape from golf ground. Good luck and have fun!